1We who are strong have an obligation to bear with the failings of the weak, and not to please ourselves. 2Let each of us please his neighbor for his good, to build him up. 3For Christ did not please himself, but as it is written, “The reproaches of those who reproached you fell on me.” 4For whatever was written in former days was written for our instruction, that through endurance and through the encouragement of the Scriptures we might have hope. 5May the God of endurance and encouragement grant you to live in such harmony with one another, in accord with Christ Jesus, 6that together you may with one voice glorify the God and Father of our Lord Jesus Christ. 7Therefore welcome one another as Christ has welcomed you, for the glory of God. Rom 15: 1 1The strong have an obligation to bear with the failings of the weak. 1We who are strong (able to do what is made possible because of the Holy Spirit’s empowerment) have an obligation (a moral, duty and responsibility before God ) to bear (carry what is burdensome(carry what is burdensome and annoying) with the failings (error arising from weakness) of the weak. 2 Corinthians 13:9 For we are glad when we are weak and you are strong. Your restoration (overcoming “mental dislocations” brought on by arrogance and refusal to repent.) is what we pray for. 1 John 5: 1-5 says Believers obey and overcome! “1Everyone who believes that Jesus is the Christ has been born of God, and everyone who loves the Father loves whoever has been born of him. 2By this we know that we love the children of God, when we love God and obey his commandments. 3For this is the love of God, that we keep his commandments. And his commandments are not burdensome. 4For everyone who has been born of God overcomes the world. And this is the victory that has overcome the world—our faith. 5Who is it that overcomes the world except the one who believes that Jesus is the Son of God? 1 Corinthians 9:22 — To the weak I became weak, to win the weak. I have become all things to all men, so that by all possible means I might save some. Galatians 6:2 — Carry one another’s burdens, and in this way you will fulfill the Law of Christ. for he will be great in the sight of the Lord. He shall never take wine or strong drink, and he will be filled with the Holy Spirit even from his mother’s womb. Philippians 2:4 — Each of you should look not only to your own interests, but also to the interests of others. 1 Thessalonians 5:14 — And we urge you, brothers, to admonish the unruly, encourage the fainthearted, help the weak, and be patient with everyone. All voices have to Christ on His terms — which means they agree to the essential Bible doctrines that determine repentance and salvation and His 10 Commands & Sermon on The Mount. Otherwise we are entering into fellowship with what violates God’s Commands, which the Holy Spirit never would motivate. John 13:34 qualifies the type of love we are to have: “x34A new commandment I give you: Love one another. As I have loved you, so also you must love one another. 7Therefore welcome one another (receive, with strong personal interest; to grant one access to our hearts; to take into friendship and close contact) as Christ has welcomed (God and Christ have received us who, formerly were estranged from them. They have united us with themselves by the blessings of the Gospel), for the glory of God. Hebrews 12:2 — looking to Jesus, the founder and perfecter of our faith, who for the joy that was set before him endured the cross, despising the shame, and is seated at the right hand of the throne of God. Heb. 13: 12-13 12So Jesus also suffered outside the gate in order to sanctify the people through his own blood. 13Therefore let us go to him outside the camp and bear the reproach he endured. let not those who seek you be brought to dishonor through me, O God of Israel. 7For it is for your sake that I have borne reproach, that dishonor has covered my face. 8I have become a stranger to my brothers, an alien to my mother’s sons. 9For zeal for your house has consumed me, and the reproaches of those who reproach you have fallen on me. Moses also came alongside the Israelites and stood with them to bear the reproach they were under. Heb. 11: 23- 28 — 23By faith Moses, when he was born, was hidden for three months by his parents, because they saw that the child was beautiful, and they were not afraid of the king’s edict. 24By faith Moses, when he was grown up, refused to be called the son of Pharaoh’s daughter, 25choosing rather to be mistreated with the people of God than to enjoy the fleeting pleasures of sin. 26He considered the reproach of Christ greater wealth than the treasures of Egypt, for he was looking to the reward. 27By faith he left Egypt, not being afraid of the anger of the king, for he endured as seeing him who is invisible. 28By faith he kept the Passover and sprinkled the blood, so that the Destroyer of the firstborn might not touch them. Like Moses, if God uses us to come along side certain other people, we can see God deliver them. Our challenge is to be obedient to be appropriately available. Rom 15:5 NLT —May God, who gives this patience and encouragement, help you live in complete harmony with each other, as is fitting for followers of Christ Jesus. While we can associate with anyone at work, at play, and when engaging in hobbies, events etc… we only can have intimate fellowship with those who are of precious like-minded faith. Faithful Fellowship between brothers and sisters in Christ means it must be centered around what is faithful to Christ according to His Scriptures. Essential Biblical Truths and Commands are Immutable Absolutes, Irrefutable Doctrines of Biblical Certainty that provide Necessities & Essentials for all believers, about which there can be no compromise. Doctrinal issues that pertain to salvation, discipleship and holiness (10 Commandments, Sermon on The Mount,) We may not live these perfectly, but the Holy Spirit motivates thoughts, actions, activities and behaviors that are consistent with them. Doctrinal issues that are evidence of salvation, such as living out the provisions of the sermon on the Mount, which is built off the commands the God gives us throughout the totality of Scripture. Not worshipping idols. Convictions should be formed from Biblical Evidence but about which there is lacking Biblical Certainty. Issues include speaking in tongues, when and under what circumstances does God heal; what day should one worship; does one drink alcoholic beverages, which Jesus made in John 2 and apparently partook of according to Matt 11: 18-19 & Luke 7: 33-34, whereas John The Baptist did not. Choices should be informed by conscience, which should be informed by Biblical evidence. Choices stem from our Endearments that are born of personality and personal style preferences that appeal to our likes and dislikes. Since there are no unredeemable personality types, most of our style choices can be acceptable to God. For instance, my favorite color is blue, and your favorite color may be something else, both of which are acceptable to the Spirit of God. But to repeat, while we can associate with anyone and anything, depending upon how the Holy Spirit convicts us, we only can fellowship in the Spirit, including engaging in prayer meetings, with people who adhere to the Essentials of Salvation and Commands of God, and are not in open refutation of them — either by commission and omission. As the Scriptural people called by God’s name, we must not mistakenly think the Holy Spirit motivates fellowship that involves neglecting, making mistakes about and ignoring Biblical essentials and commands. We must not treat them as optional convictions, nor be deceived by people who do so. understand how to grow in endurance (patient in steadfastness, as God enables us to persevere to “remain under” the challenges He allots in life). to walk in hope (joyful and confident expectation of eternal salvation, through Christ, which Ellicott’s Commentary calls “Messianic hope” of glory, that fortifies the Christian to endure trials with firmer tenacity. (14) Let’s Pray that God ReAwakens, ReInvigorates & ReEstablish Us in Our Calls In Christ! 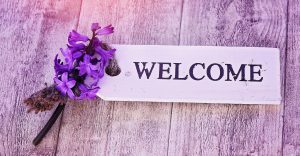 God grant us the grace to faithfully fulfill Your plan for us to participate in welcoming those You welcome.